Lengths, Widths, Surfaces: A Portrait of Old Babylonian Algebra and Its Kin. (Studies and Sources in the History of Mathematics and Physical Sciences). New York: Springer, 2002. Table of contents and introduction.NB: The presentation appearing on the publisher's website (12 September 2007) is totally misleading. Mellem gåde og videnskab. Et essay (især) om noget der blev til algebra. (Filosofi og Videnskabsteori på Roskilde Universitetscenter. 1. Række: Enkeltpublikationer, 1995 nr. 2). Roskilde: Institut for Sprog og Kultur, Roskilde Universitetscenter, 1995. Algebra på lertavler. København: Matematiklærerforeningen, 1998. L'algèbre au temps de Babylone : Quand les mathématiques s'écrivaient sur de l'argile. Paris: Vuibert & Adapt-SNES, 2010. Title page + table of contents (avec la dédicace oubliée par l'editeur). Algebra in Cuneiform: Introduction to an Old Babylonian Geometrical Technique. Berlin: Edition Open Access, 2017. “Algebra and Naive Geometry. An Investigation of Some Basic Aspects of Old Babylonian Mathematical Thought”. Altorientalische Forschungen 17 (1990), 27–69, 262–354. “Mathematical Susa Texts VII and VIII. A Reinterpretation”. Altorientalische Forschungen 20 (1993), 245–260. “A Note on Old Babylonian Computational Techniques”. Historia Mathematica 29 (2002), 193–198. Preprint. “nam-lú-ulù des scribes babyloniens. Un humanisme différent – ma non troppo”, pp. 73–80 in Inge Degn, Jens Høyrup & Jan Scheel (eds), Michelanea. Humanisme, litteratur og kommunikation. Festskrift til Michel Olsen i anledning af hans 60-årsdag den 23. april 1994. (Sprog og kulturmøde, 7). Aalborg: Center for Sprog og Interkulturelle Studier, Aalborg Universitetscenter, 1994. “Old Babylonian Mathematical Procedure Texts. A Selection of «Algebraic» and Related Problems with Concise Analysis”. Max-Planck-Institut für Wissenschaftsgeschichte. Preprint 3 (1994). Manuscript. “Changing Trends in the Historiography of Mesopotamian Mathematics: An Insider's View”. History of Science 34 (1996), 1–32. Preprint. “«The Four Sides and the Area». Oblique Light on the Prehistory of Algebra”, pp. 45–65 in Ronald Calinger (ed. ), Vita mathematica. Historical Research and Integration with Teaching. Washington, DC: Mathematical Associ/ation of America, 1996. Contains upwards of 60 printing errors – the editor seems not to have realized that computer conversion should be followed by proof reading. Manuscript. “«Les quatre côtés et l'aire» – sur une tradition anonyme et oubliée qui a engendré ou influencé trois grandes traditions mathématiques savantes”, pp. 507–531 in Histoire et épistémologie dans l'éducation mathématique. Actes de la première Université d'été européenne, Montpellier 10 au 13 juillet 1993. Montpellier: IREM de Montpellier, 1995. The publisher having omitted proof-reading, the article contains some 270 errors, including wrong formulae and skipped passages. Corrected republication pp. 192–224 in E. Gallo, L. Giacardi & C. S. Roero (eds), Associazione Subalpina Mathesis. Seminario di Storia delle Matematiche “Tullio Viola”. Conferenze e Seminari 1995–1996. Torino: Associazione Subalpina Mathesis, 1996. Manuscript for the republication. “Pythagorean ‘Rule’ and ‘Theorem’ – Mirror of the Relation Between Babylonian and Greek Mathematics”, pp. 393–407 in Johannes Renger (ed. 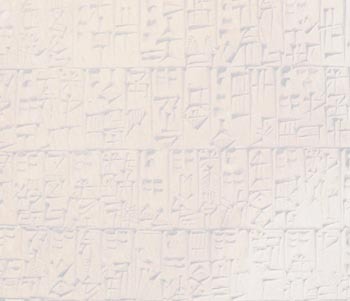 ), Babylon: Focus mesopotamischer Geschichte, Wiege früher Gelehrsamkeit, Mythos in der Moderne. 2. Internationales Colloquium der Deutschen Orient-Gesellschaft, 24.–26. März 1998 in Berlin. Berlin: Deutsche Orient-Gesellschaft / Saarbrücken: SDV Saarbrücker Druckerei und Verlag. Manuscript. “The Finer Structure of the Old Babylonian Mathematical Corpus. Elements of Classification, with some Results”, pp. 117–177 in Joachim Marzahn & Hans Neumann (eds), Assyriologica et Semitica. Festschrift für Joachim Oelsner anläßlich seines 65. Geburtstages am 18. Februar 1997. (Altes Orient und Altes Testament, 252). Münster: Ugarit Verlag, 2000.Preprint. “Seleucid Innovations in the Babylonian «Algebraic» Tradition and Their Kin Abroad”, pp. 9–29 in Yvonne Dold-Samplonius et al (eds), From China to Paris: 2000 Years Transmission of Mathematical Ideas. (Boethius, 46). Stuttgart: Steiner, 2002. Preprint. “Mathematik. I. Mesopotamien. II. Ägypten. III. Mesopotamische und ägyptische Einflüsse auf die griechische Mathematik”, pp. 1010b–1016b in Der Neue Pauly. Enzyklopädie der Antike, Bd. 7. Stuttgart & Weimar: Metzler, 1999. Seriously maltreated by the editors without my knowing so, a correct version should be under way in the online edition. Manuscript. “Mesopotamian Mathematics”. Forthcoming in The Cambridge History of Science, vol. 1. Manuscript. “Mathematics, Mesopotamian”, pp. 4351–4352 in Roger S. Bagnall et al (eds), The Encyclopedia of Ancient History. Chichester, West Sussex: Wiley-Blackwell, 2013. Online DOI: 10.1002/9781444338386. Manuscript without misspelling of the author's name. “Geometry, Mesopotamian”, pp. 2894–2895 in Roger S. Bagnall et al (eds), The Encyclopedia of Ancient History. Chichester, West Sussex: Wiley-Blackwell, 2013. Online DOI: 10.1002/9781444338386. Manuscript without misspelling of the author's name and conversion errors. “Mathematics and Early State Formation, or, the Janus Face of Early Mesopotamian Mathematics: Bureaucratic Tool and Expression of Scribal Professional Autonomy”. Revised contribution to the symposium «Mathematics and the State», XVIIIth International Congress of History of Science, Hamburg/Munich, 1st–9th August 1989. Filosofi og videnskabsteori på Roskilde Universitetscenter. 3. Række: Preprints og Reprints 1991 nr. 2. “Bronze Age Formal Science?”, pp. 81-102 in Benedikt Löwe, Volker Peckhaus & Thoralf Räsch (eds), Foundations of the Formal Sciences IV. The History of the Concept of the Formal Sciences. (Studies in Logic, 3). London: College Publications, 2006. Preprint. “Early Mesopotamia: A Statal Society Shaped by and Shaping Its Mathematics”. Contribution au colloque “Les Mathematiques et l'état”, Cirm-Luminy, 15 octobre–19 octobre 2001. Mimeo, Roskilde University, October 2001. “Was Babylonian Mathematics Created by ‘Babylonian Mathematicians’?”, pp. 105-119 in Hans Neumann & Susanne Paulus (eds), Wissenskultur im Alten Orient: Weltanschauung, Wissenschaften, Techniken, Technologien. 4. Internationales Colloquium der Deutschen Orient-Gesellschaft, 20.–22. Februar 2002, Münster. Wiesbaden: Harrassowitx Verlag, 2012. “On Parts of Parts and Ascending Continued Fractions”. Centaurus 33 (1990), 293–324. Manuscript of preprint. “Artificial Language in Ancient Mesopotamia – a Dubious and a Less Dubious Case”. Journal of Indian Philosophy 34 (2006), 57–88, doi: 10.1007/s10781-005-8169-4. Preprint. The original publication is available at www.springerlink.com. “Textos de procedimientos matemáticos de la antigua Babilonia. Una selección de problemas `algebraicos´ y relacionados con un analisi conciso / Old Babylonian Mathematical Procedure Texts. A Selection of `Algebraic' and Related Problems with Concise Analysis”. Mathesis 13:3 (Mexico, 1997), 224–253. Preprint (English version only). “The Roles of Mesopotamian Bronce Age Mathematics: Tool for State Formation and Administration - Carrier of Teachers' Professional Intellectual Autonomy”. Educational Studies in Mathematics 66 (2007), 257–271. Manuscript. “Le origini”, pp. 11–36 in Claudio Bartocci & Piergiorgio Odifreddi (eds), La matematica. I: I luoghi e i tempi. Torino: Einaudi, 2007. Manuscript. NB: P. 15, lines 18–17 from bottom in the published version, the parenthesis “(cioè legati ... immediato)”, should be removed. It was inserted by the publisher or editors and says exactly the opposite of what should be said. “Les Lais: or, What Ever Became of Mesopotamian Mathematics”, pp. 11–36 in Micah Ross (ed. ), From the Banks of the Euphrates. Studies in Honor of Alice Louise Slotsky. Winona Lake, Indiana: Eisenbrauns, 2007. Manuscript. “How to transfer the conceptual structure of Old Babylonian Mathematics: solutions and inherent problems. With an Italian Parallel”, pp. 385–117 in Annette Imhausen & Tanja Pommerening (eds), Writings of Erly Scholars in the Ancient Near East, Egypt, Rome and Greece: Translating Ancient Scientific Texts. (Beiträge zur Altertumskunde, 296). Berlin & New York: De Gruyter, 2010. Preprint. [Review of H. J. Nissen, P. Damerow & R. Englund 1991. Frühe Schrift und Techniken der Wirtschaftsverwaltung im alten Vorderen Orient. Informationsspeicherung und ‑verarbeitung vor 5000 Jahren. 2. Auflage. Bad Salzdetfurth: Verlag Franzbecker / Berlin: Max-Planck-Institut für Bildungsforschung, 1991]. Written for Mathematical Reviews, for some reason never published (anticipated by an unsolicited review by Jöran Friberg?).Manuscript. “Old Babylonian ‘Algebra’, and What It Teaches Us about Possible Kinds of Mathematics”. Contribution to the ICM Satellite Conference Mathematics in Ancient Times, Kerala School of Mathematics, Kozhikode, 29 August – 1 September 2010. Preprint, 8 September 2010. “A Hypothetical History of Old Babylonian Mathematics: Places, Passages, Stages, Development”. Ganita BhāratÌ 34 (2012; actually 2014), 1–23. “Written Mathematical Traditions in Ancient Mesopotamia: Knowledge, Ignorance, and Reasonable Guesses”, pp. 189-213 in Daliah Bawanypeck & Annette Imhausen (eds), Traditions of Written Knowledge in Ancient Egypt and Mesopotamia. Proceedings of Two Workshops Held at Goethe-University, Frankfurt/Main in December 2011 and May 2012. Münster: Ugarit Verlag, 2014. ASeleucid, Demotic and Mediterranean Mathematics versus Chapters VIII and IX of the Nine Chapters: Accidental or significant Similarities?@. Studies in the History of Natural Sciences 35 (2016), 463B476. AWhat Is `Geometric Algebra', and What Has It Been in Historiography?@. AIMS Mathematics 2 (2017), 128-160. “As the Outsider Walked in: the Historiography of Mesopotamian Mathematics Until Neugebauer”, pp. 165-195 in Alexander Jones, Christine Proust & John M. Steele (eds), A Mathematician’s Journeys: Otto Neugebauer and Modern Transformations of Ancient Science. Cham etc. : Springer Verlag, Verlag, 2014..
[Review of H.-J. Waschkies, Anfänge der Arithmetik im Alten Orient und bei den Griechen. Amsterdam: B. R. Grüner, 1989]. Zentralblatt für Mathematik und ihre Grenzgebiete 0760.01001. [Review of Maurice Caveing, Essai sur le savoir mathématique dans la Mésopotamie et l'Égypte anciennes. Lille: Presses Universitaires de Lille, 1994]. Mathematical Reviews MR1393937 (98b:01006). [Review of Asger Aaboe et al, Saros Cycle Dates and Related Babylonian Astronomical Texts. (Transactions of the American Philosophical Society, Vol. 81, Part 6). Philadelphia: American Philosophical Society, 1991]. Archives Internationales d'Histoire des Sciences 43 (1993), 380f. Manuscript. [Review of Hannes D. Galter (ed. ), Die Rolle der Astronomie in den Kulturern Mesopotamiens. Beiträge zum 3. Grazer Morgenländigen Symposion (23.–27. September 1991). (Grazer Morgenländischen Studien, 3). Graz, 1993] Archives Internationales d'Histoire des Sciences 46 (1996), 159–161. Manuscript. Review of Grégory Chambon, Normes et pratiques: L’homme, la mesure et l’écriture en Mésopotamie. I. Les mesures de capacité et de poids en Syrie Ancienne, d’Ebla à Émar. Gladbeck: PeWe-Verlag 2011.Orientalistische Literaturzeitung 110 (2015), 438–440. Critical abstract of Kazuo Muroi, “Reexamination of Susa mathematical text no. 8”. Sugakushi Kenkyu 140, 50-56 (1994). Critical abstract of Kazuo Muroi, “Reexamination of the first problem of the Susa mathematical text No. 9”. Historia Scientiarum, II. Ser. 3, No.3, 231-233 (1994). Babylonian Algebra from the View-Point of Geometrical Heuristics. An Investigation of Terminology, Methods, and Patterns of Thought. Roskilde: Roskilde University Centre, Institute of Educational Research, Media Studies and Theory of Science, 1984. 21985. Outdated.